The Environmental Protection Agency (EPA) has declared Bexar County as a “marginal nonattainment” area. This designation is the lowest level of nonattainment classification possible. San Antonio was previously deemed in attainment. Seven other neighboring counties including Atascosa, Bandera, Comal, Guadalupe, Kendall, Medina, and Wilson are still classified as attainment/unclassifiable. Nonattainment status is determined by the EPA according to the National Ambient Air Quality Standards (NAAQS) of the Clean Air Act. In 2015, the standards were lowered by the Obama administration from 75 parts-per-billion (ppb) to 70 ppb. San Antonio currently measures at 73 ppb. The Texas Commission on Environmental Quality (TCEQ) will be responsible for performing Point Source Emissions Inventories. New businesses or expansions that will increase emissions by more than 100 tons per year will be required to complete a TCEQ permitting process called a New Source Review. 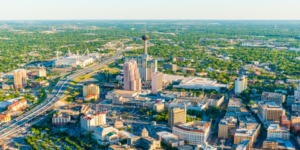 The Alamo Area Metropolitan Planning Organization (AAMPO) will be responsible for ensuring planned projects do not worsen the air quality levels. If you have questions or would like to discuss how this change may affect your actions in the San Antonio region, please contact aci here. See the current National Ambient Air Quality Standards (NAAQS) here.